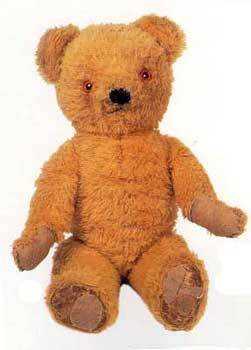 The vintage Chad Valley teddy bear can be often easily identified by their large amber eyes which stand them apart from early teddy bears that often had much smaller black button eyes or small coloured glass eyes. Favoured by the British royalty during the 30's and granted a royal warrant, allowed the company to prosper through the Second World War whilst other companies folded. The Chad Valley company during the 1950's was one of the first to start to produce bears based on TV and radio characters. Bears such as Sooty and his dog side kick Sweep were very popular at the time, as was a bear called Toffee which appeared on the BBC radio program "Listen with Mother, all were produced by the company. Antique teddy bears from Chad Valley at the time of writing (2013) are valued between £100 to £1000. Large flat ears set at the corners of the head. Rexine was used for paw pads; this has a suede look. The company was granted the royal warrant in 1938 after which all bears had a label which read "Toy Makers to Her Majesty the Queen". This changed in 1955 to read "Queen Mother". Celluloid button situated in ear or upper body. 1950's bears had a paper label hung around their necks which read "Hygienic Toys".